3+ Unique homepage layout: Three homepages with three different styles: Bright, Creative and Fantastic. The powerful core theme: "Powerful" means if you want to add any elements or custom something on your web store, just choose among the selections available, no coding or programming. Various elements to build a perfect and vivid website: Headers, footers, Google fonts, color variations, layouts for product category page, layouts for product detail page and dozens of blog category layouts. Ultimate responsive design: When mobile devices usage overwhelms desktop usage, responsive design becomes indispensable for any web store. We design Handmade WordPress theme to look great regardless of devices visitors are using. - Dashboard management with full control of inventory, sale, discount, etc. We have gone over the most outstanding feature of Handmade WordPress theme from Cmsmart provider. 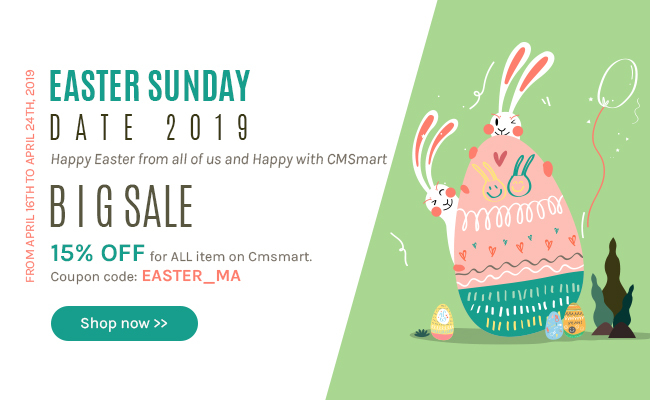 You can find a lot of handmade shop theme from other Cms solution provider but what I want to say here is Cmsmart made it a solution, not just a simple theme, a solution with full plugins and various layouts. This WordPress theme can be considered as a giant on the market. So, don't hesitate to try it and you will be impressed.